Sorry this is late again, I haven’t recovered fully from my cold yet! Today I’m writing about Where in Time is Carmen Sandiego which was released by Broderbund software back in 1989. It was one of the very first commercial games that we bought for our old DOS machine. The game is very similar to its predecessor, Where in the World is Carmen Sandiego, which we played at school on the old Apple IIe machines in primary school, and early PC’s in high school. We used to play the game a fair bit, some of our favourite bits were the animations in the lab and coffee lounge, with the exploding lab equipment and the coffee machine that was often faulty. The basic premise of the game is simple. Carmen and her V.I.L.E henchmen are stealing artifacts around the world in different time frames. Your job is to track the thief down by traveling through time to different locations to find clues about where they are going and who they are. Fortunately if you weren’t super smart already, the game came with a handy almanac containing lots of historic information, and the copy protection for the game. Of course nowadays with the internet it is much easier to find the same information. The graphics in the game are quite pleasing, they are colourful and the animations are nice and smooth. The game supports many different graphics modes including CGA, EGA, and of course VGA. The best mode to pick is obviously VGA, but all the modes have nice graphics considering what they have to work with! If you look around the building when you first start the game up you’ll find some amusing little animations of the lab explosions, and a coffee machine that doesn’t work that well. Sound can come from the PC speaker or Adlib sound card. We used to use the PC speaker sound which was quite good, but if you have a Adlib or Sound Blaster card I’d recommend those as they sound better. I believe digitized sound was also supported but I’ve never heard it as we never had it configured. The game play is pretty good if you like puzzle games, and will stimulate your mind. I found that I didn’t often need to use reference material that often as the clues are often relatively intuitive. The limited travel options often help make the elimination process easier. It is important however to make sure you check for information about the person you are chasing. If you don’t know who you are chasing when you capture them, they will be let off as you don’t have the evidence and it won’t count towards your case record. As you catch more crooks you will get promoted and are given more difficult cases, this is where you’ll need the reference material more as the clues become more cryptic. It’s a good game for kids that teaches them a little geography and history. The difficulty is fairly easy to begin with, but does get hard enough to challenge even an adults knowledge. It can get a bit repetitive as the basic formula for each case is the same, so it is best played in short sessions. Unfortunately some of the information in the game is a little out of date due to it being as old as it is, but for the most part the information is right. The internet makes a nice research tool for when you are playing, so you only really need the printed almanac for the copy protection. In reading around the internet I ran into a couple of old articles/emails that were about computers, and programmers from quite a while ago. The first one is a description of what “real” programmers are like, and the encroaching mass of “Quiche eaters” that program in pascal. Reading through it was quite interesting and amusing, and gives a bit of insight into what computing and software design was like for the early pioneers. You can find this short rant here. It really shows how much things have changed! I remember similar things being said back when I was at university. “Real programmers use vi” was one of the favourites used. Fortunately it was only ever used jokingly, as silly things like this really shouldn’t be used to judge how good someones programming skills are. That and vi is one of the most un-usable programs around! I much prefer to use pico or nano when they are available or just echoing data directly to a file. What kinds of silly “real programmer…” type statements have you heard? The second article I read today is a story about a “real” programmer named Mel. He is a remarkable programmer who wrote entire programs directly in machine code (basically writing lots of 1’s and 0’s). He did many optimizations himself that were better than compilers of the time and were quite impressive! You can read about Mel here. Sorry this post is a little late, I’ve been sick over the last couple of days and this post is a bit longer than most. Xargon was released by Epic Mega Games back in 1993. I first played the shareware version shortly after it came out on our 386sx, we had got it on a cover disk like many other games we played at the time. The game is very much like Jill of the Jungle but has improved graphics and more levels. It quickly became one of my favourite platform games as it has many interesting environments, situations, items and levels. The game is divided into 3 episodes with the first one being the shareware version, fortunately the game was made freeware by its authors in 2008. So I’ve since been able to complete the entire trilogy. Like many other DOS games of the era the story is pretty simple. You play as Malvineous Havershim who is an archaeologist that becomes trapped in a strange world. You find out that there is an evil entity named Xargon that has many reactors around the land. An eagle (named Silver tongue) tells him he needs to destroy the reactors and Xargon himself. So yeah the story is not very impressive, but then again not many stories from games of that era were! Like the last Jill of the Jungle, there is a map screen which you navigate to travel to levels, it’s also the only place you can save. Each level has its own unique environment, with a unique set of different puzzles and hazards for you to get past. Again like in Jill of the Jungle there are some items that will transform you into a bee, and a submersible that allows you to travel under water. The submersible is reasonably maneuverable but not so much it makes the game easy. There are a couple of levels in the first episode that are mostly underwater which I am quite fond of. There are a number of different type of weapons in the game including rocks, fire balls, the standard laser and rapid fire lasers. Each one is different and useful in different levels. For instance some of the levels have rocks as the main weapon available, you need to master bouncing the rocks around to kill the enemies. If you really need a weapon (or other power ups for that matter) you can buy them with emeralds you can collect. You can also collect fruit to get extra health, if you collect enough and you don’t need the extra health it will save it for when you do which is nice. The gameplay is not as action focused as many other platformers, but still requires you to have good platforming skills. You have unlimited lives so you don’t have to worry about dying too much, although when you do it is necessary to start the current level from the beginning. This could be annoying if you die in one particular place often, but I didn’t really have this problem too often. I found if you take your time, plan ahead, and explore for extra emeralds you shouldn’t have too much trouble getting through the levels. The game does offer a slowed down mode called granny mode if you really have trouble, but I wouldn’t recommend this as I think it slows the gameplay down too much. Graphics are nice and colourful with many different environments and enemies. Many sprites are reused as are some of the graphics for the levels, but given the size of the game and that they only appear in environments you’d expect, it’s kind of understandable. The game only supports VGA which for the time is to be expected. Sound can come from a number of devices namely the PC speaker, Sound Blaster or Adlib (for music only). I believe a few of the more obscure devices are also supported but I do not know anything about what they sound like. On the PC speaker the sound is good for what the speaker can do, but if you have the option Sound Blaster digitized sound is far superior. Music is the same for the Adlib and Sound Blaster for obvious reasons and is quite good, but can be a bit loud and distracting at times. You should set your mixer settings appropriately before you play this game! Xargon plays well on most older PC’s but you wouldn’t want anything less than a 386 20Mhz, and ideally you’d want to play on a 30-40Mhz system to avoid slow down in some areas. It works well on Dosbox as long as you give it enough cycles and the sound is reasonably good. 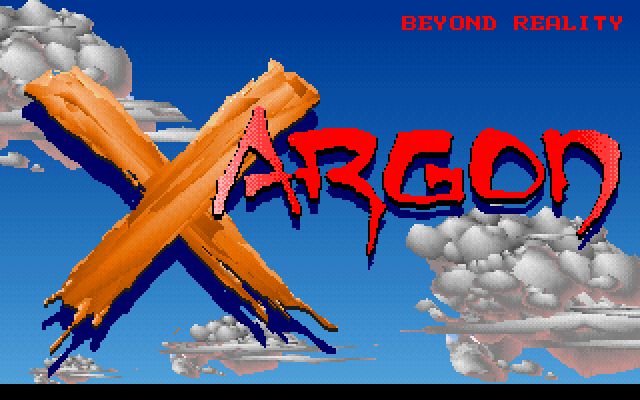 In my book Xargon has stood the test of time, and still remains a good playable platformer. It may take a while for people to get used to the slower pace and some of the different weapons (such as the rock), some of which add to the experience within the level they exist in. It’s a different kind of platformer. Duke Nukem is an action platform game made by Apogee (now 3d realms) back in 1991. 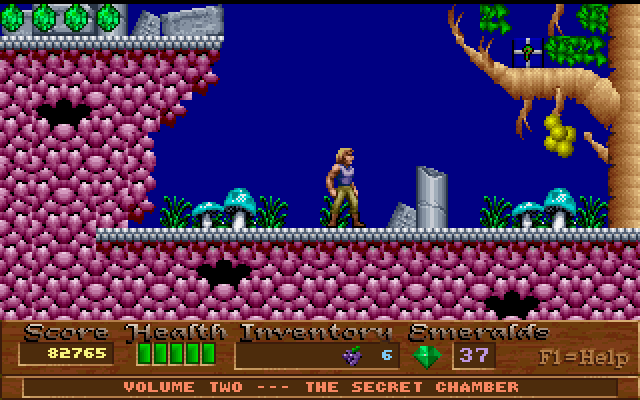 The game was written for MS-DOS based systems and used EGA graphics and PC speaker sound. I remember first seeing the game at a cousin’s house on their Tandy 1000 PC. We played it for a short time, as I was into playing platform games at the time I found it pretty fun. We never did get a copy of it for our 386sx computer, and so I never really played the game to any depth until relatively recently. The graphics are good for EGA, are animated smoothly, and full of colour. It’s pretty impressive that they managed to do so much on the screen at once. EGA was actually more difficult to program for smooth scrolling effects than VGA which was due to the way the hardware worked. By the time Duke Nukem was released VGA was pretty much the standard for most DOS games, which makes it surprising they stuck with EGA. Perhaps they were trying to make the game more compatible with older machines that would have still been quite common at the time. Sound comes from the PC speaker and there appears to be no options for other sound devices. The sound for PC speaker is actually pretty good considering what they had to work with, although there are some situations the sound can be annoying. Gameplay is where it is at with Duke Nukem. The game is full of classic platforming action and most items in the environment are interactive. When I came back to the game after not ever having completing the original, I found it was still very addictive, fun and engaging. It has a retro charm that keeps you playing to get to the next level, or a higher score. So despite the outdated technology (even at the release date) Duke Nukem has rightly become a classic DOS platform game. Any serious DOS game player should play this at some time. The full registered game is still available, but the shareware game has plenty of action if you don’t want to shell out cash for the full game. Tetris is one of the most well know computer/video games that there is, so it is no wonder that there are alot of clones around. We never had the original Tetris on our 386, but we did get a freeware clone of Tetris called Nyet made by David B. Howoth in 1988. We got it on the cover disk of a shareware magazine like we did for many of our games at the time. It quickly became a favourite game of my fathers as he really likes puzzle games. Nyet doesn’t have spectacular graphics or sound, but because of this it supports pretty much any PC hardware you can get your hands on. I had it running on an old XT machine, and appart from not having colour (it was a monochrome display) you couldn’t really tell the difference between it on the XT and a faster 386. It also runs fine on fast machines with out slow down utilities, so the timing code in the game is pretty good. Gameplay is pretty much your standard Tetris. Difficulty doesn’t start out too hard but quickly ramps up challenging your quick thinking and reflexes.You can increase the scoring rate you have by starting on a harder level to begin with, but it is of course that much more difficult to survive. My Dad got very good at it, and I have never been able to get even close to the same scores that he has. Me and my brothers used to watch him play it. Sometimes he would complain that we were distracting him too much. Usually we were waiting for our turn on the computer so we didn’t mind if he finished earlier. There are many other clones of Tetris out there, but this is in my opinion one of the better ones. Sure it doesn’t have all the bells and whistles of many of the others. But it plays extremely well, runs on pretty much anything (even windows!) and will challenge even the best players. Check out my Dad’s high scores in the gallery below, see if you can beat his scores. Be sure to use the same version of the game!